When Sir Christopher Frank Carandini Lee passed away at the age of 93 in Chelsea, London recently, the world lost a true star in the annals of science fiction, fantasy, and horror. He left a legacy that will be hard for any other actor to rival, with more than 270 credits over sixty-nine years to his name. His long career saw him star in major Hollywood productions, such as the Johnny Depp remakes of Charlie And The Chocolate Factory and Dark Shadows, as well as less well received fare like Police Academy: Mission To Moscow. Lee also played parts in countless genre favourites such as The Young Indiana Jones Chronicles, The Golden Compass, The New Adventures of Robin Hood, Gormenghast, The Tomorrow People, and Sleepy Hollow, and was even the narrator of The Rocky Interactive Horror Show. It goes without saying that Lee made his name as a star of countless horror movies (he claimed in interviews to have made only 15 out-and-out horror flicks, but admitted that others would not agree with that small a count). 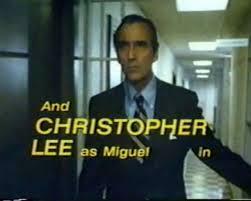 A regular fixture in Hammer films, Lee starred alongside other household names like Peter Cushing in movies that remain cult classics to this day. In memory of such a towering talent, let’s take a look at the 10 most memorable roles Christopher Lee played in films and TV shows beloved by genre fans.